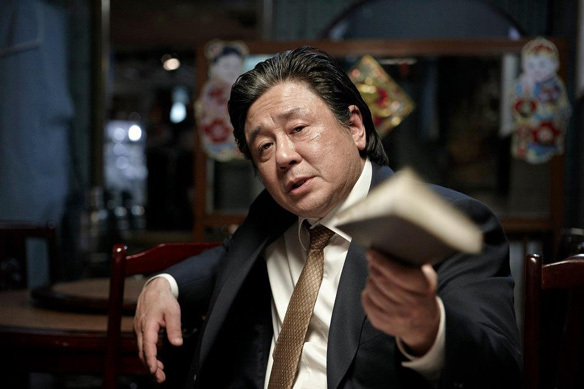 Old Boy's Choi Min-sik stars in NAMELESS GANGSTER, a film by Yun Jong-bin. Picture courtesy CJ Entertainment. All rights reserved. 1982, Busan. 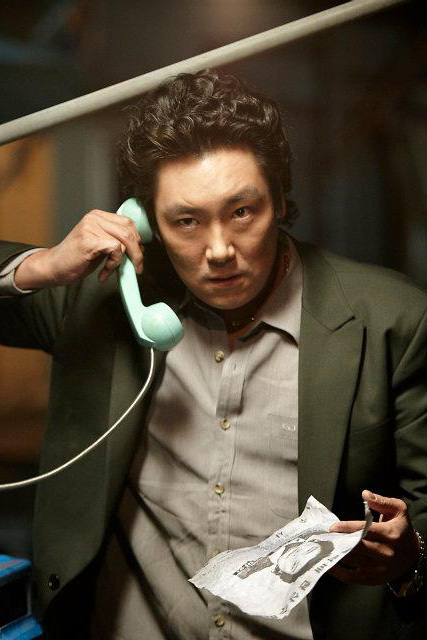 Ik-hyun (CHOI Min-sik) is a corrupt customs officer who is on the verge of getting fired for bureaucratic reasons. He decides to go out with a bang when he comes upon a bag full of heroine and in an attempt to sell it to Japan, he partners up with Busan's top gangster boss Hyung-bae (HA Jung-woo). Ik-hyun immediately wins the trust of Hyung-bae with his ability to solve hurdles and to talk his way out of tricky situations. With Hyung-bae's back alley prowess and Ik-hyun's lobbying skills, the two men begin to take over Busan. Their era has finally come. When the war against crime was announced in the '90s, cracks in their relationship became more visible, and they begin to look for the right moment to backstab each other and take over the syndicate. Who will rise over the other and have the final laugh? The film opens with President Noh Tae-woo declaring a war against crime organizations in October 1990. As Ik-hyun, the boss of the organization, is led inside the prosecutor's office, he is swarmed by a group of hungry press. The story flashes back to 1982 to show how an ordinary civil servant can become the boss of a large organized crime syndicate in just a short decade. Two main characters' struggle for power, to carry out visions for the organization and to take over the city of Busan is both brutal and exciting. The critics are curious. Once the press release of the actors from the movie NAMELESS GANGSTER was announced, they were feverishly writing to mention the ultimate match between CHOI Min-sik and HA Jung-woo and who will going to be more suitable for the part because both acted as serial killers in their previous films. However, to everyone's surprise, NAMELESS GANGSTER can be considered a comedy because of the characters' comedic qualities in their acting this time. JO Jin-woong, MA Dong-suk, KIM Sung-gyun and GWAK Do-won: An ensemble of supporting actors who allow the villains to shine! Although CHOI Min-sik and HA Jung-woo are prominent actors, they would not have done a fabulous job without a solid group of supporting roles. NAMELESS GANGSTER is lucky to have several important actors, such as JO Jin-woong as Hyung-bae's chief competitor, MA Dong-suk as Ik-hyun's chivalrous right hand man, KIM Sung-gyun as Hyung-bae's main go-to henchman, and finally, GWAK Do-won as the unflinching prosecutor who will go to extreme lengths to bring down all organized crime syndicates in Busan. All of these actors worked together to add colors to the '80s and to allow the two main stars to rise to the top. Director YOON Jong-bin made his directorial debut with THE UNFORGIVEN when he was only 25 of age. He dealt the subject of the mandatory military service, which is something that all Korean men can associate with, but it was difficult because the film was completed as his graduate project in school so he had to do it with almost no budget. Despite his situation, the film was invited to Busan Film Festival that year and later, it was also invited to Cannes. His second feature film THE MOONLIGHT OF SEOUL captured the reality of night life in the city of Seoul. By this, he proved that his films are true to life. With his third work, which is NAMELESS GANGSTER, YOON surely steps up to demonstrate that he can successfully recreate a time period with such thrill and excitement. "I'm not a gangster. I'm a civil servant." Taking bribes, smuggling contrabands, there's nothing he won't do for his family. On the verge of getting fired, Ik-hyun is exposed to the seedy underbelly of Busan via Hyung-bae's crime organization. Known as 'godfather' to those close to him, Ik-hyun utilizes his natural-born lobbying skills to rise to the top of food chain. His thirst to survive and instincts are second to none. I SAW THE DEVIL marked his first film in 4 years and return to form with his trademark intensity. With such vicious role, no one could stare at his eyes when meeting him by chance on the street, but for his role as Ik-hyun, CHOI gained over 10kg with a hairstyle that made him look like just another ordinary men in the neighborhood. Unlike his previous roles in I SAW THE DEVIL and OLDBOY, Ik-hyun is a deceitful but equally genial character. For an actor with such wide spectrum of skills and abilities, his involvement with this film is a boon to many. "Just as a student must study, a gangster must fight when it's necessary." In Busan, only one man commands the city despite his young age. He's been betrayed by those who were close to him, but when Ik-hyun comes along and when Hyung-bae discovers that they're distantly related, he slowly opens his heart and makes him his partner-in-crime. Having catapulted into fame as the actor with the mask of a serial killer (THE CHASER), HA Jung-woo is now a household name. Over a short span of his career, the actor has tackled diverse genres, ranging from comedy, thriller, drama to sports, whether it's a blockbuster or an art house project. HA's filmography is filled with challenges and unexpected choices. Unlike other young rising stars whom often go after commercial and mainstream movies, HA has sought the development of his career with many independent and unique films. Cult movie THE FOX FAMILY and KIM Ki-duk's independent film TIME are the examples of his rebellious choices, refusing to be incorporated into the mainstream. "Hyung-bae, I'm not the same snot-nosed kid who used to light your cig." Rose to his own after coming up in the same gang as Hyung-bae, Pan-ho was always the second in line. Despite his title as the big man in his own gang, he can't compete one-on-one with Hyung-bae. He approaches Ik-hyun and tries to seduce him into his organization in order conspire against Hyung-bae. 2011 could be marked as the breakthrough year for the actor, who became a hot commodity after appearing in period TV drama 'Deep Rooted Tree' as Chosun era's most fierce and dangerous swordsman. 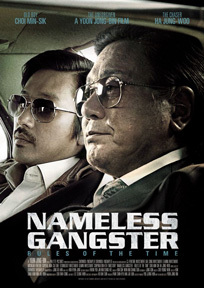 In NAMELESS GANGSTER he faces off with HA Jung-woo's Hyung-bae in order to become the number one gangster in Busan. "But I'm suppose to be righteous. How could I work in the night life scene?" Originally a taekwondo master and coach, Kim is dragged into the dark world of organized crime when Ik-hyun didn't have anyone to back him up during his rise. He possesses the facade of a gangster but like Ik-hyun, he is ultimately not cut out for this world. He stirs the relationship between Ik-hyun and Hyung-bae when he clashes with Hyung-bae's right hand man. "I don't care if you're a gangster or not... If you're a gangster, I'm just another gangster." Infamous among the gangsters as a prosecutor who can't be bribed and seduced, prosecutor Jo is strictly by-the-book. Even Ik-hyun's lobbying skills come to a stand-still in the face of prosecutor Jo. Could he bring down the entire network of syndicates in Busan? 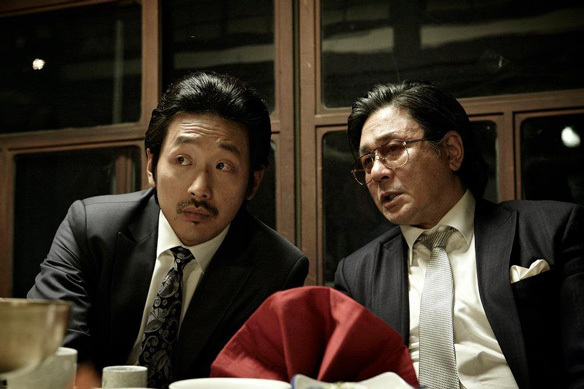 A scene from NAMELESS GANGSTER, a film by Yun Jong-bin. Picture courtesy CJ Entertainment. All rights reserved. 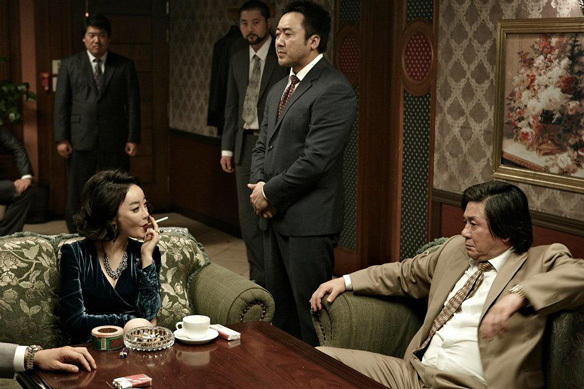 The Chaser's Ha Jung-woo stars in NAMELESS GANGSTER, a film by Yun Jong-bin. Picture courtesy CJ Entertainment. All rights reserved.